Kids just don’t understand the value of a dollar, and it’s not their fault. It can be a tricky subject for parents to teach; heck, it’s a tricky subject for some parents to learn themselves. That’s where GreenStreets: Shmootz Happens enters the scene. It’s a free app that helps to teach the 5-10 group how to save, budget, and spend wisely. 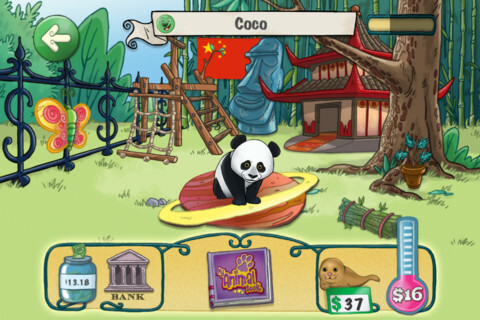 In the app kids choose endangered animals to save and each one comes with a cost. Players then earn money by playing different mini-games cleaning up after a chaos-causing monster named Shmootz. Weeds need to be pulled from the garden, the recyclable items should be sorted in the treehouse, and a robot is waiting to be built in the center of town. 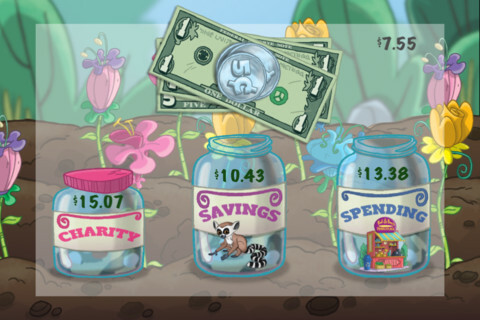 Money is earned for each task and is divvied out between three money jars; the first 10% goes to charity and then it’s up to the player to decide what is saved to help the animal and what is used for fun spending money. As a reformed spender the message of this app is invaluable. My parents tried their hardest to teach me about being frugal and responsible with my allowance, but kids will be kids and I had a real taste for expensive bubble gum. Then I became a parent myself and the cold reality of a budget hit me like a brick to the head. How was I supposed to teach my kids to be smart with their money when I didn’t even know myself? My 3- and 5-year-old aren’t quite old enough to tackle this particular app so I went though it myself. The illustrations – from Shrek creator Tom Hester – were really cute and perfect for the targeted age group. Games were easy and fun to play and verbal directions meant no reading required. I was so happy to rescue a baby seal that I even named him Smitty. Neal Godfrey created the Green$treets method 30 years ago and still remains the foremost authority on teaching kids about a buck. This new app moves the method into the hands of the newest little big spenders. Because it’s free, and it also teaches kids an important lesson, we made it our newest All Star app.